Whenever the day comes that you can finally subscribe to YouTube TV, it’ll be worth the wait. The $35-per-month streaming bundle is only available in markets where YouTube TV can carry at least three live local broadcast channels, which right now covers about half of U.S. homes. And to watch YouTube TV on a television, you need a Chromecast dongle, a Chromecast-enabled Android TV device, or an Apple TV for AirPlay. For those who live within the YouTube TV footprint—and don’t mind using a phone, tablet, or laptop as their remote—Google’s streaming bundle is an excellent value. It’s also the best attempt yet at combining live, on-demand, and recorded TV into a comprehensible interface. With broader app support and a larger coverage area, it could be the best streaming bundle for most people. 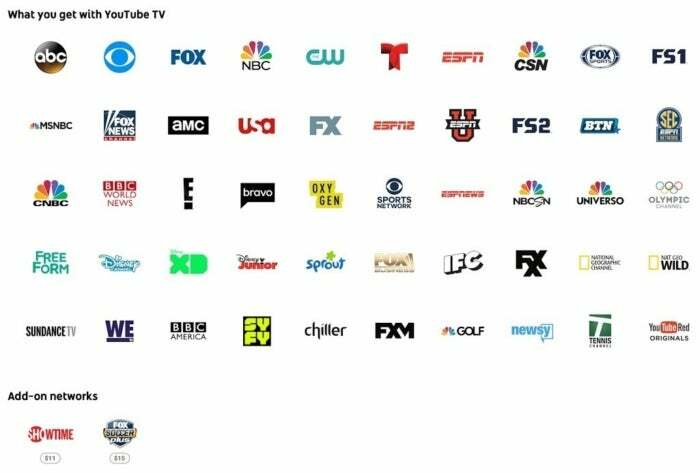 YouTube TV is a one-size-fits-all bundle, with nearly 50 channels for $35 per month. The lineup includes the major broadcast networks, ESPN channels, regional sports from Fox and Comcast, cable news from MSNBC and Fox News, and a slew of entertainment channels such as FX, AMC, SyFy, and Disney Junior. Access to YouTube Red originals are thrown in at no extra charge, and you can add Showtime for $11 per month and Fox Soccer Plus for $15 per month. The YouTube TV channel list as of August 2017. Like other streaming bundles, YouTube TV omits some networks to keep prices down. You won’t get any channels from Turner (TNT, TBS, CNN), Scripps Networks (HGTV, Food Network), Discovery Communications (Animal Planet, Science), or Viacom (Comedy Central, MTV), and the package doesn’t include league-specific sports channels such as NFL Network or NBA TV. Google is also a bit less stringent about including the local channels than it was at launch, when it offered live feeds from ABC, CBS, NBC, Fox, and CW in five markets. Now, some markets only include live local broadcasts from three of those channels, with on-demand video from the rest. Each subscription entitles you to three simultaneous streams, and up to six people can have their own favorite shows and DVR recordings (more on that shortly). 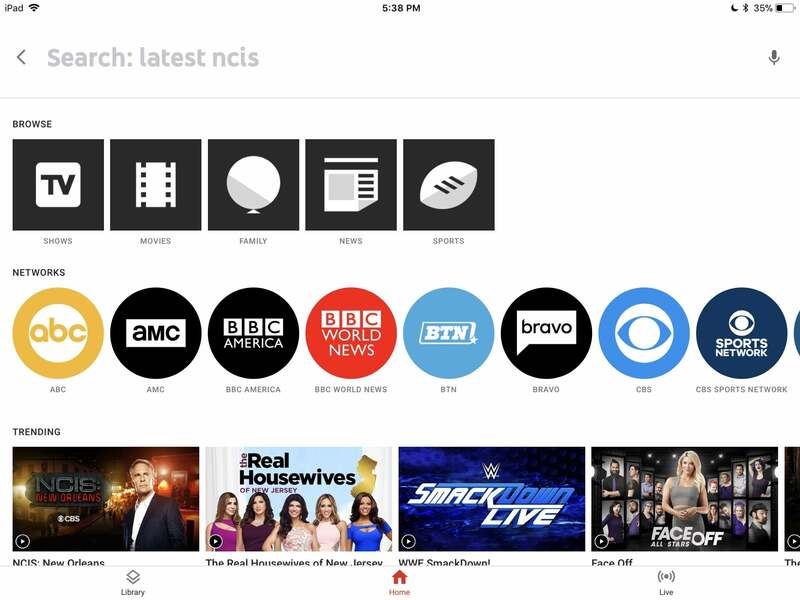 YouTube TV also works with about 20 TV Everywhere apps, so you can log in and watch shows even on platforms that the service doesn’t support yet. YouTube TV doesn’t charge extra for DVR, like Sling TV does, nor does it set storage limits like Sling TV, Hulu, and FuboTV do. And while recordings expire after nine months, that’s more generous than the 28-day window afforded by Sony’s PlayStation Vue bundle. The service also supports partial recordings, and it lets you watch the recorded portion of a program while it’s still airing live. You can pause any live TV channel and rewind through what you’ve already watched as well. 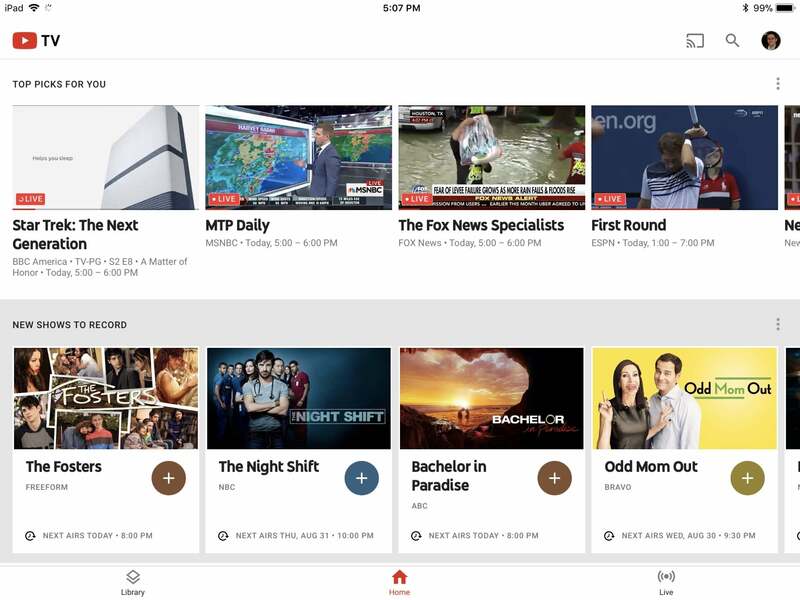 YouTube TV’s on-demand and DVR menu as seen on an iPad. Here’s the catch: YouTube TV replaces recordings with on-demand streams when possible, and the on-demand versions don’t allow ad-skipping. In those cases, expect to sit through about a minute and 30 seconds of ads for each commercial break, which tends to line up with the breaks in the live telecast. Google reportedly conceded the on-demand issue to TV networks so it could otherwise build the DVR it wanted, and overall the tradeoff seems worthwhile. Because you don’t have to expend any mental energy on storage management, YouTube TV frees you to make liberal use of the “+” button that accompanies every program, and you’ll quickly build up a backlog of movies and shows to watch as a result. Still, an option to pay extra for full DVR privileges—like what Hulu offers with its live TV service—would be helpful. Here’s how I know YouTube TV nailed the design for its apps: I can explain them without having to think too much. The main menu splits off into three sections: The Home section recommends channels and shows to watch based on your viewing habits, the Library section lists all the on-demand and recorded programs that you’ve marked as favorites, and the Live section shows what’s on and what’s up next for each channel in the lineup. The YouTube TV menu has three main sections, plus a search button. Naturally, these three sections won’t cover everything you want to watch, so at some point you’ll likely hit the search button in the app’s top-right corner. And that’s where YouTube TV unleashes its inner Google-driven beast. The basic search function is powerful on its own, letting you look up titles, actors, directors, genres, sports teams, and even specific seasons or episodes. But below that empty text field are lots of other ways to peruse the YouTube TV catalog. You can browse by channel, each of which has its own subsections for featured programming. You can select a genre, and YouTube TV will present shows or movies that it thinks you’ll like. 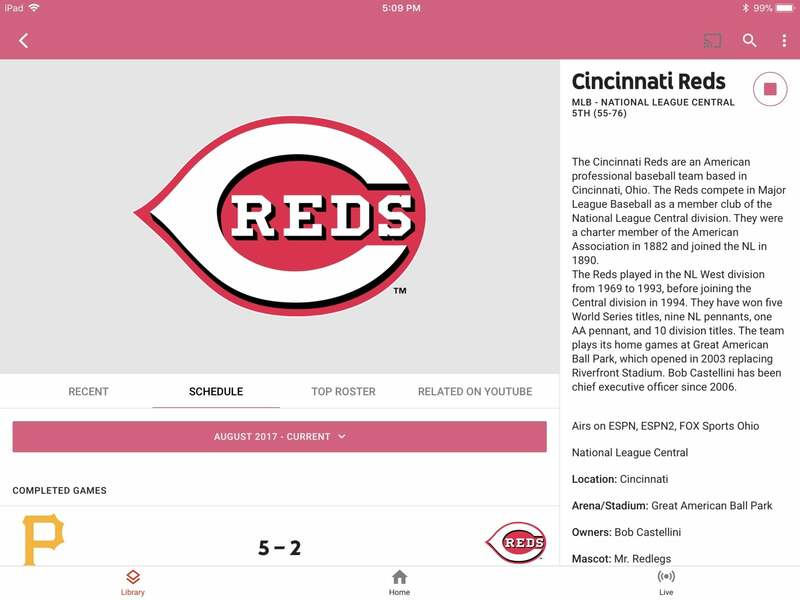 You can even dig through a list of every sports league covered by YouTube TV’s channels. By hiding all this navigational power behind the search button, YouTube TV avoids cluttering up its main menus. Just look at all these ways to browse. Individual program pages are similarly rich. For movies and shows, YouTube TV provides a plot synopsis, cast information, and related programming. For sports, you‘ll see team information, league rankings, scores, and roster details. My only design nitpick is Google’s attempt to scatter some regular YouTube videos throughout the interface. In theory this helps create continuity between the two services, but the tone and quality of YouTube videos are in such sharp contrast with Hollywood production that their inclusion just comes off as ham-fisted. Google recently told Cnet that it plans to support more TV devices in the fall, but the company didn’t give a timeframe or name any specific platforms. 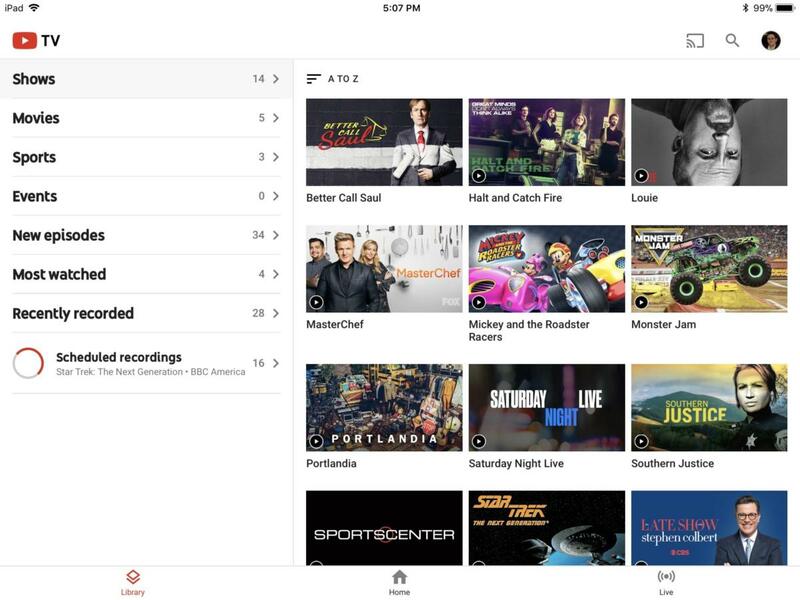 For now, it’s hard to envision how the YouTube TV interface will translate to television platforms like Roku and Apple TV. The current system leans on concepts that only make sense on touchscreens, such as split-screen navigation panels, expandable detail buttons, and swipe gestures. Hopefully YouTube TV’s design won’t suffer in the move to television screens. YouTube TV has been mostly reliable in my experience. Channels typically loaded within a couple seconds, and fast forwarding through videos seldom required any buffering or major drops in quality. Still, the service is not immune to occasional weirdness. In a couple instances, fast forwarding through on-demand videos caused them to restart from the beginning after hitting a commercial break. I’ve also heard one user complaint about recording a baseball game that ran exceptionally long. YouTube TV also gets the mark of shame for capping all videos at 30 frames per second, despite the fact that YouTube proper has supported 60-frames-per-second video for almost three years. Google says it has no plans to change this, sticklers for smoothness in their sports and news telecasts are still better off with DirecTV Now or PlayStation Vue. YouTube TV is great for sports fans, framerates aside. So far, every streaming bundle I’ve tested has at least one notable weakness. Sling TV lacks two of the four major broadcast networks in most markets, DirecTV Now lacks DVR, PlayStation Vue is a bit on the pricey side, FuboTV’s apps are unpolished, and Hulu with Live TV is a little too clever for its own good. YouTube TV’s biggest weakness is simply that it’s unavailable in half the country and on the most popular streaming devices. But it could be the best bundle for most people someday.